Of the movies which I remember seeing on our old 19-inch, black-and-white Zenith TV in the late 1950s and early 1960s, one favorite series was produced by the Army and titled “The Big Picture.” The apparent size of that “big picture” (in a tube) seemed quite adequate for our living room, but every now and then I was exposed to much “bigger pictures” at the Capitol and Center Theaters, and “really big pictures” at the 601 and Salisbury drive-ins, but of those last two, mostly the Salisbury Drive-in. The Salisbury Drive-in was truly “Salisbury’s” due to its being not far from downtown, unlike the “601” out in the county, or Joe’s Drive-in hidden by trees. In trying to observe heavenly bodies (sounds like I’m still talking about Joe’s, but I’ve switched the subject) such as star clusters and galaxies, light pollution from the city is not conducive to a good telescopic view, but Salisbury’s city lights gave no serious competition to the images projected onto the screen of its drive-in namesake. Close by the drive-in was a car dealership-motor company; and I can’t recall its name just now, but I’m sure that some of you can. I’m certain that there was a proper outside sign, but the only exterior advertisement which I recall seeing from the drive-in consisted of something a little “different,” a balloon in the shape of a rocket, complete with stabilizing fins (at least it seemed like a balloon, but it might have been made of something a little more substantial). It appeared to revolve or float around the top of a pole at the dealership, and I estimated that pole to be about 100 feet in height. One of my memories of the Salisbury Drive-in dates back to 1960, when our family went to see the Jerry Lewis movie “Visit to a Small Planet,” in which Lewis played an intergalactic visitor. This was not long removed from the time in which UFO sightings were happening in many parts of the country, and Jerry reminded us that even if beings from another galaxy are more technologically advanced, they, just like us, may also be a little bit “goofy.” In the projected night sky, Jerry Lewis’ flying saucer appeared, courtesy of Hollywood; and floating in the real night sky just past the drive-in’s screen was the “rocket,” courtesy of the car dealership. 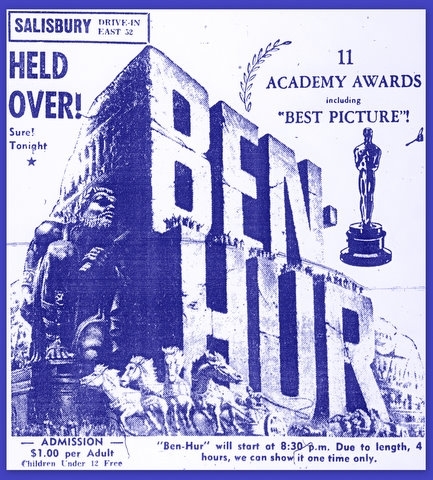 We also saw “Ben-Hur” at the Salisbury Drive-in; where the chariot race by its very nature benefited greatly from being “held” outdoors, minus four walls and a roof. The concession stand not only had popcorn, Milk Duds, and Raisinetts, but also hot dogs, hamburgers, pizza, ice cream — i.e., a meal. Stepping out of the car on the way to the concessions, the movie’s dialogue fell silent, but was gathered up again intermittently as one came within range of, then passed by each parked car’s window-hanging speaker. Automobiles still park in some of that space now, but their owners exit them and go inside the places of business that have been constructed on the old drive-in’s site. To the best of my memory, the first establishment to physically replace that drive-in was a Food Lion. The earth was covered over with asphalt, because although the parking for a drive-in only requires bare ground and a little gravel for an entrance and exit path, parking for a grocery store seems to necessitate that the entire surrounding surface of the establishment be paved. What more unsurprising and “sort-of” appropriate agent of replacement, especially in Salisbury, than a Food Lion (Salisbury Historic District and other historic buildings in the city and Rowan County, of course, NOT even remotely intimated in this statement!). The Food Lion built on the site of the old drive-in was later replaced by other businesses, along with their associated paved parking. Though I drove by not long ago and saw what is currently, physically present in that area, in my mind’s eye, up here in Danville, Va., I still can’t picture anything else ever being there, neither then nor now, except the Salisbury Drive-in. In saying this, I mean no slight to those whose workday lives and work-friends are now centered in those businesses occupying that place where people once used to just sit, listen, stare (at about a 45 degree angle, or a little less), talk, eat concession food, and sometimes kiss. The rocket is gone as well.